In Stock and ready to Ship! 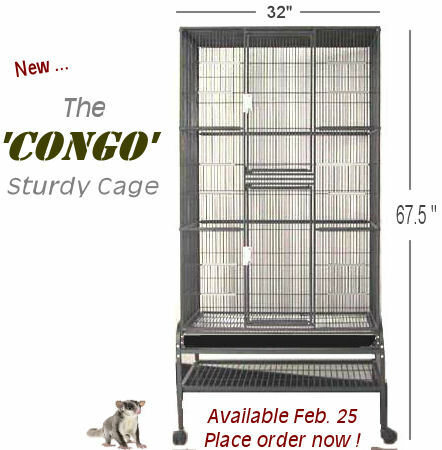 This large sturdy ‘Congo’ cage is designed by Exotic Nutrition and manufactured by the HQ cage company. Made specifically for Sugar gliders, but can also be used for Flying Squirrels and other small mammals. The ‘Congo’ Cage measures 52 inches tall, 32 inches wide, and 21 inches deep, and that’s without the stand which comes included with the ‘Congo’ Cage, when you add the height of the stand – which has a shelf to store your pet accessories, the entire thing measures 67.5 inches tall. The bar spacing is 1/2 inch wide and the wire is finished in a heavy powder coated animal safe paint. Ideal cage for housing Sugar Gliders, Flying Squirrels, Marmosets and other small mammals. This is not a bird cage (with lots of small front doors for feed dishes that you have to tie-down to prevent escape) the front panel of the cage has two large front doors, there are 2 small doors on each side of the cage for easy access. The Congo Sturdy Cage comes complete with 3 removable shelves and 3 removable ladders, also included are 2 double feed dishes and 3 removable wood climbing bars. The stand is on heavy rolling wheels, so moving it around is easy. The bottom grill (which is over the pull-out tray) also pulls out making cleaning and placement of oversized toys and branches easy. A pull out plastic tray for easy cleaning is also included. Cage is removable from the stand and can lock-onto the stand for security. Two giant doors in the front for easy access to your pet. Available in: Black. View this item HERE.